This walk: 2014-4-21. Burrator Arboretum re-opening by BBC Spotlight weather forecaster Emily Wood, in partnership with Radio Devon, the event being one of their recently started listeners' walks. The car park before the walk - cars were parked a long way down the road as well. BBC Radio Cornwall vehicle at this BBC Radio Devon walk, no wonder someone was a bit confused! Neil explains further ..... attended by Jacky in her Easter hat! A resting place combined with a passing place for wheelchairs. 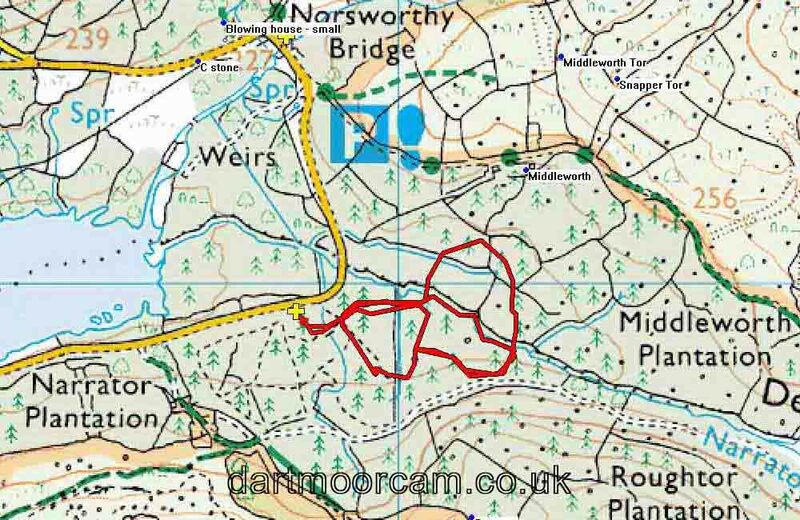 This walk was reached from Yelverton by following the road towards Princetown, turning right immediately after the Burrator Inn at Dousland, then turning left after leaving the houses, onto open moor (with Drake's leat i.e. Plymouth Leat down on the right). Drive to the dam and continue straight past it, around the "top end" of the reservoir, over Norsworthy Bridge and past it's car parking area until you see the Arboretum car park on the left, marked by the yellow cross on the map. Entry is via the wheelchair-friendly gate in the car park. Distance - 1.88 km / 1.17 miles. There are other tracks as well in the Arboretum and many other walks in the area.